In preparation to welcome April 2009 into our life, we went to have Baskin Robbins (actually is cause 31st March, just to make it sound dramatic). It was an unplanned one but everyone agreed to it or basically the five of us, me, Soo Mei, Pei Ling, Fan Sheng, and Li Theen, agreed to it. 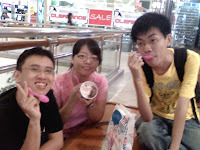 So... what we did back then was just drive our asses to Midvalley Megamall and grab ourselves 2 Handpacked Pints. One of them is Something Mint (can't remember), eeeeuuuuwwwww... I got goosebump just by typing that. Another is way cooler, Very Berry Strawberry + World Class Chocolate, ahhhh~ I can still remember the sweet scent in my mouth. Gotta go grab one again the next promo. the suggestorz, Kai Sien (all in picture, Li Theen's hand). The place is filled with strange, funny, weird and nice quotes, one of which is "If it weren't for the last minute, nothing would get done". You might wanna know what we had there, I'll let the picture do the talking this time. Can't remember the name of this bucket thing, trash something or something trash. There's some lobster in the middle. Ok... I can't remember this as well... but it's damn freaking nice. 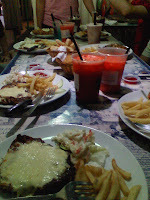 and eat till we drop... OK... that only apply to Pei Ling as she had too much cheese... Double Cheese Assorted Mushroom + Double Cheese Seafood Baked Rice = Quadruple Cheese Nausea Attack. Argh... they didn't even send me the photos we took there. 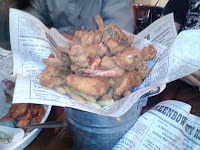 Herm... need promote Pei Ling's blog, if you really wanna have a look at what we ate and know more bout this outing, just visit Teddy's Lair (the link is provided on the right sub menu). Langat's Look Out Point. We ate at Gasoline, I guess that's the place with a wider choice and variety of food and beverages up there. All of us got our food and have fun talking crap while eating. 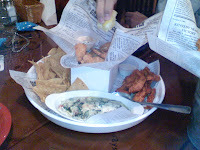 Looky looky at our food (picture on the right). 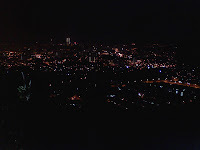 picture of KL from the tower in Look Out Point, we can actually see Genting Highlands from up there, it's just that nice. Ops.... just noticed I termalas put the name of the attendees.... hahahahaa.... They're..... ta ta ta daaa~~~ Me, Li Theen, Fan Sheng, Soo Mei, Kai Sien, Shook Yean auntie, Teck Wei, and Kok Kiong. 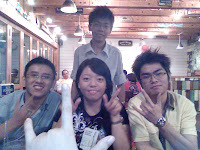 After the dinner, I just forcefully invite them to my house which is quite near to the place. 10 minutes drive... or less. Haha... and we found out my Dog, Sammi is above Soo Mei in the Bully Chain. Soo Mei got bullied by my dog. Ok... and then on the 21st of April... my sista's birthday. I went there again, to the Look Out Point to treat my family to a dinner. It's been awhile since we last had a dinner like this. It's fun to have family time like this. I think that's all from me this time. If you wanna have in-depth story on any of the outing/event, or just wanna look at more pictures, just give me a nudge or message. eee...I only went for one of the outing out of three..=(But It looks nice..yaya so memorable like what sumi_amo said..Oh Uh la la..I can't wait for the next coming up outing/trip..So where are we heading to? btw, do not discriminate mint flavor ok?It's my very favorite..and thanks for promoting my blog here =p...and for those photos I grab from bong bong cai's facebook also...go get it there!Please no more blog during exam season r..you will stimulate my itchy hands..